It's official. If you go to Alaska in 2018, don't bother trying to take a picture of anything, because there will be a Princess ship in the way. Wherever you look, Princess ship. The state will be full of Princess ships, because it will be the line's largest deployment ever there, and it all goes on sale December 1. For 2018, Princess is posting a whopping 15% capacity increase in Alaska. Details appeared in the November 22 issue of Cruise News Daily. In an unusual occurrence today, two people died within 45 minutes of each other in separate accidents on separate shore excursions from the same ship. The incidents occurred while Celebrity Solstice was docked at Tauranga, New Zealand. The complete story appeared in the November 22 edition of Cruise News Daily. The first steel was cut today for another new ship, but not just any new ship. This will be the fist of the new Edge class for Celebrity, named Celebrity Edge, scheduled for delivery in the fall of 2018. The event took place at the STX France yard at Saint- Nazaire. 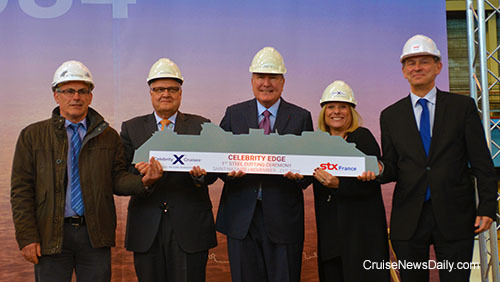 At today's steel cutting it was revealed that the second ship in the Edge class will be named Celebrity Beyond. It will enter service in the spring of 2020. The complete story appeared in the November 21 edition of Cruise News Daily. Photo courtesy of Celerity Cruises. All rights reserved. May not be copied or used without express permission. 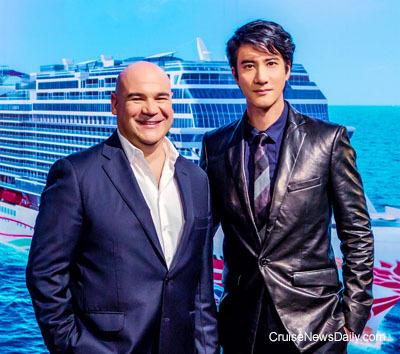 Norwegian Cruise Line chose Chinese pop star Wang Leehom as godfather of Norwegian Joy which will be based in China. MV Werften chose MAN Diesel & Turbo to supply the engines for Star Cruises' two World-class ships. Details appeared in the November 21 edition of Cruise News Daily. Photo courtesy of Norwegian Cruise Line. All rights reserved. May not be copied or used without express permission.